It is getting cold. And though that means many bad things — chapped lips, dry skin, outfits that are impossible to plan because nothing keeps you warm enough — it also means something very good: soup weather. Soup is probably my favorite food group. It’s hot, brothy, and makes you immediately feel like you’re being snuggled by your own dinner. And perhaps the most wonderful thing about soup is that you can make it in large batches, freeze it in tupperware, and then heat it up in portions whenever you need something warm and yummy. 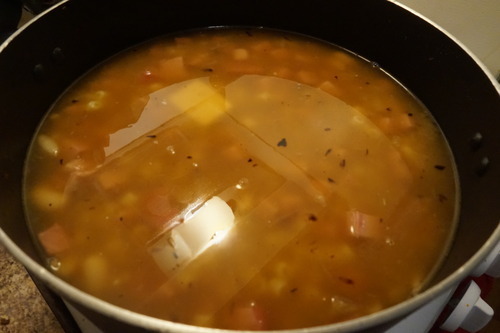 A good soup recipe will get you through the whole winter, and no recipe is better (or easier) than my mom’s white bean and ham recipe. It will fix whatever ails you, particularly if your ailment is being hungry and loving robust flavors. -A pound of black forest ham (or whatever ham you prefer). Have your deli guy cut this into a block instead of slices. 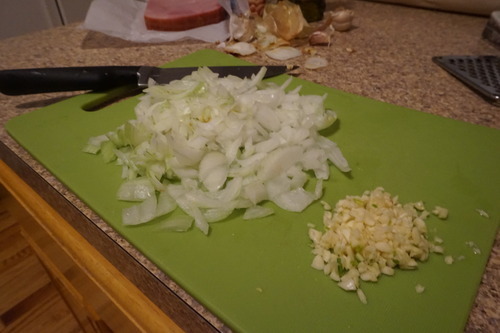 Mince your garlic, roughly chop your onion. Easy enough. Put your onions at the bottom of your large soup pot with a nice little coating of olive oil at the bottom. Add a bit of salt and cracked black pepper, and let them reduce down until they are mostly translucent. 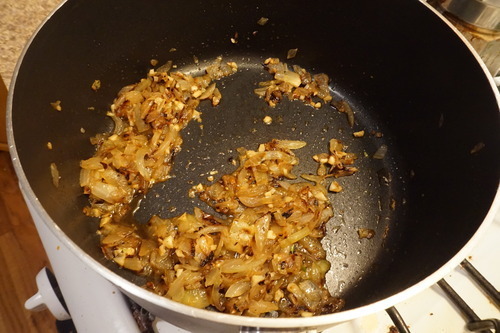 Add the garlic and continue until they are a yummy goldeny-brown. 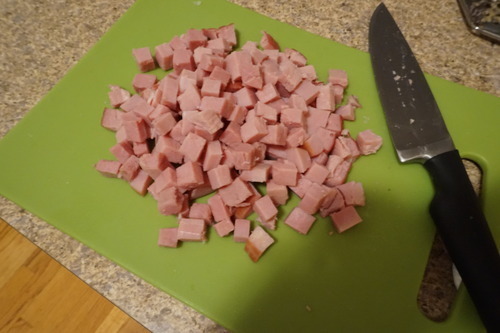 While they are browning up, cube your ham, like so. 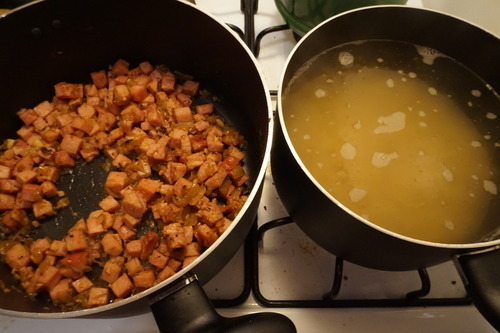 Add your ham to the onion and garlic, let it get a little caramelly as well and reduce down a bit (ham has a LOT of water in it). While you are doing this, put your pasta into some boiling water and let it cook about halfway. You want to do this because otherwise the pasta will absorb almost all of your broth, and make it more like a pasta with a thick sauce and less like a yummy, brothy soup. 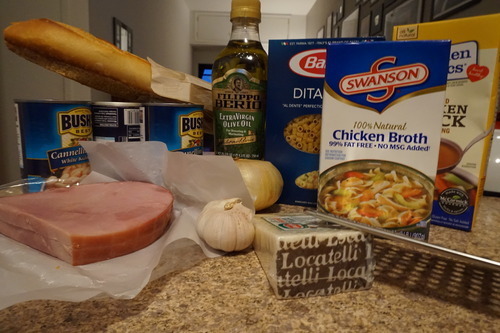 When your pasta is halfway cooked (just a few minutes), drain — but do not rinse — and add to your soup. 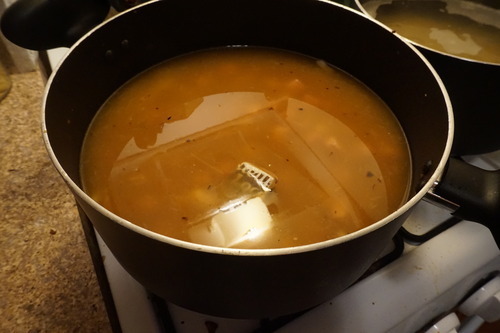 Let it cook and reduce until it’s a bit thicker (you can mash up a bit of your beans at the bottom as a little way to cheat your way to a thicker broth, but it should get pretty rich on its own as the pasta absorbs more of it). Salt and pepper to taste. 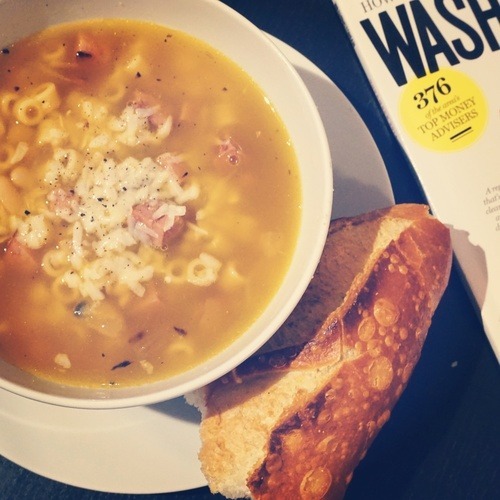 Ladle into bowls and top with a generous amount of fresh grated pecorino, and a bit more cracked pepper. Break off a crusty piece of bread for serving! And don’t forget to put the leftovers into the freezer (you can make as much of this as you want), so you can re-heat whenever for a delicious winter meal! One quick note about adapting this recipe: It’s really easy to make vegan, if you swap out the ham for some broccoli rabe and use vegetable stock. 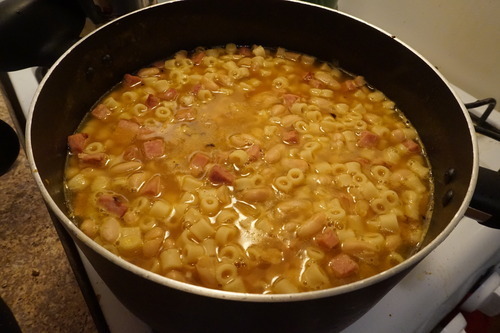 You can also just add leafy greens to the regular recipe if you like, though I prefer to just have it with a big bowl of broccoli next to it (or whatever veg I have on hand), because I like the simplicity of the beans, pasta, and ham. But make it right for you! Like The Financial Diet on Facebook here.